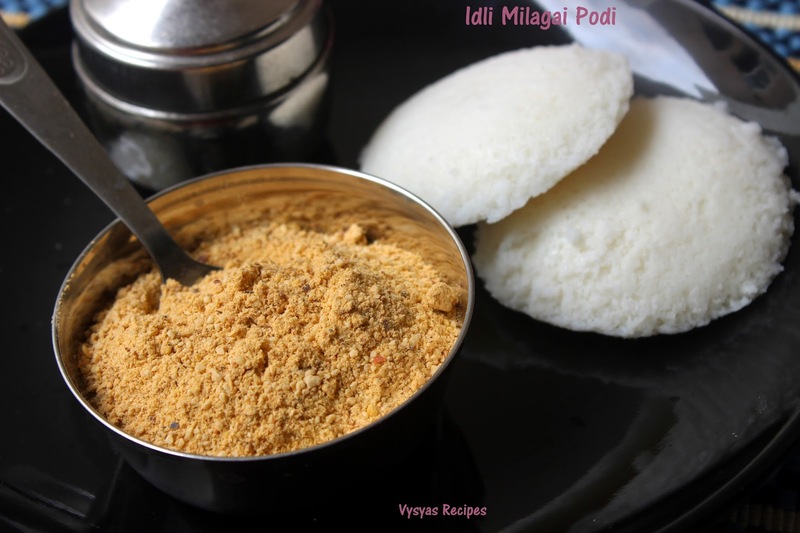 Idli Milagai Podi is a great accomapaniment with idli, Dosa,Paniyaram(Gunta Ponganalu) & uttapam.This freshly ground Powder can be sprinked on top of crispy dosa, then it becomes Podi dosa & if you top it on thick uttapam it becomes podi Uttapam. 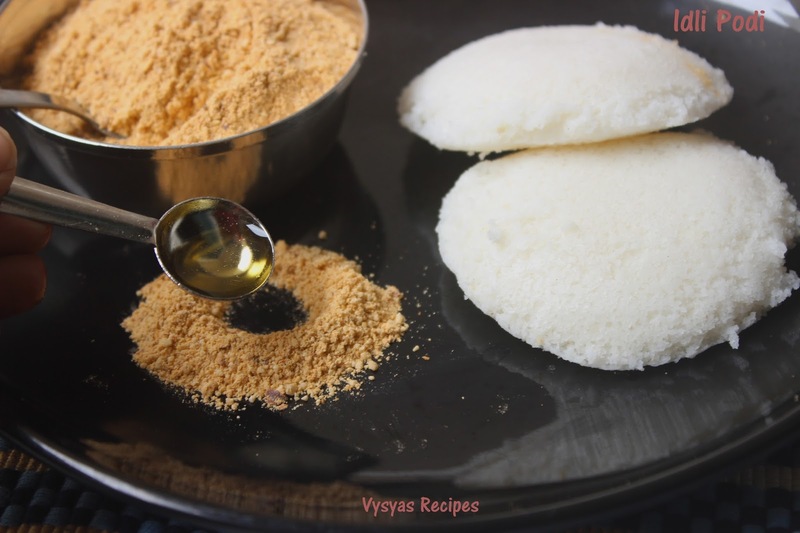 you can try variations with dosa batter by using this Milagai Podi.My husband never eats Paniyaram & Uttapam without this Podi.I am not a big fan of Idli's.but with this idli Podi, i love to eat idli's. Idli Podi mixed with Sesame oil, coated on both the sides of idli's is Perfect for Lunch box or at travel. Dry Roast Urad dal & chana dal till it turns Golden brown colour & also it gives nice aroma, remove it from kadai.Add hing & salt with it & mix it. (hing & salt should be mixed with heat of the dal). In a same kadai add curry leaves & Red chillies saute till it turns crisp. When it cools down Completely, grind every thing into a coarse Powder. you can add 1 tbsp of sesame seeds & saute seperately till it crackles & it changes the colour , & grind it with other ingredients for extra flavour. While serving mix this Podi with sesame oil for Good taste. It Goes well with idli,dosa,Paniyaram & uttapam. 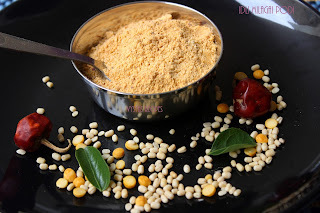 Mix this podi with sesame oil & coat all over the idli's both the sides, & pack it for lunch box or travel. After making crispy dosa, drizzle some oil & sprinkle this podi all over the dosa, to make podi Dosa or make thick Uttapam & sprinkle this Podi on top of it , to make Podi Uttapam. I can't thank enough who ever invented this. A great life safer. At times I add sesame seeds also. I have never made chutney power before but this looks fantastic. So YUM! Idly milagai podi looks delicious adding curry leaves is nice. My favourite side dish with dosa and idly, your recipe and pictures look easy and delicious Gayathri. Will try soon, Thanks. I agree and in complete sync with Srividhya. This is one of the excellent accompaniment with idlis. This is My kind of recipe. And Loved the way you've made and presented..